Prayer is a relationship that reflects our love of G*D and Neighbor (including self, one-another, & enemies). As such any official prayer activities need to include all people and to welcome them into safe space. 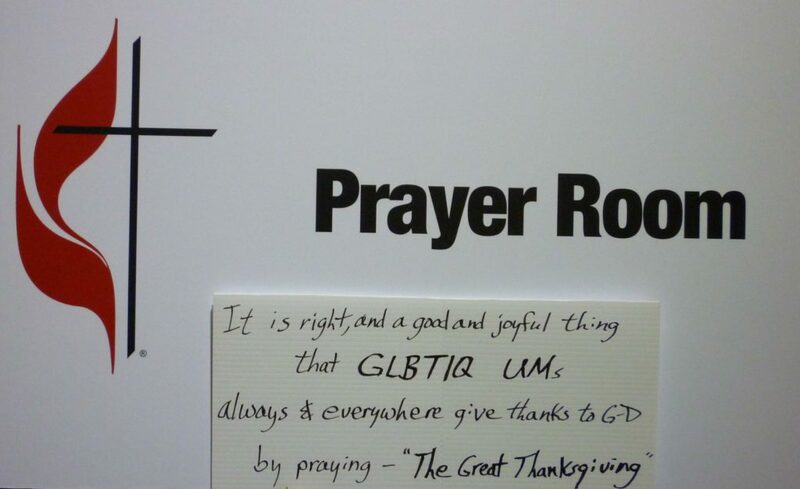 We are glad the Love Your Neighbor witness has prayer space and counselors, but we are concerned about the safety of GLBTIQ people and Allies in the official prayer space. To this end we joined the dedication and walk to quietly advocate for full inclusion of the GLBTIQ community into the United Methodist Church. This includes being able to officially celebrate communion, which includes eucharistic prayers. Here is a picture of a sign carried during the Prayer Walk. The first of the Love Prevails people arrived late morning in Tampa. More are arriving later today and tomorrow. Our first order of business was visiting the site of General Conference. The Love Your Neighbor tabernacle is quite noticeable across the street from the main entrance. Already stories are being told of their rescuing some Delegates from Africa who were stranded at the airport. Any financial support you can give to their Common Witness would be appreciated. Orientations and set-up were still going on throughout the Conference Center. Volunteers were just getting their feet under them. We met the students from Wesley Theological Seminary who are here to experience General Conference. It is good to have had a relatively light day of activity after days of travel. Tomorrow it is sleep-in time and then General Conference begins in earnest with worship and organizing procedures. Thank you for your financial support and good wishes, we are hopeful of breaking even.